Smooth and easy going, with no shortage of sheer lusciousness, punctuated by moments that demand the participant’s attention. Generally goes down easy and leaves one with a poignant memory. Best sampled with fine company, on a fair day. Admission: I don’t know wines. At all. Connoisseur is never a word that would be applied to me, unless you’re talking about trail running dogs. But, I do know a bit about trail racing, and I love a good course. And Matterhorn Ultraks’ 30 km is one of the nicest routes going. Whoever designed it should be lauded with some gold Salomons. It’s that good. This is a race that’ll be around a long, long time. It doesn’t take a lot to realize that fact– even though 2014 is but the race’s second birthday. The basics are flawless: a world-famous Alp mountain town, top-notch race organization, and a friendly, fun vibe—including a race course with alphorns on route, and several twists and turns through the narrow paths of high alp hamlets. Two other major factors send Ultraks over the top: its inclusion as part of the Skyrunning Federation series, and a course that’s not to be missed. There are, in fact, four races in the Ultraks event—16 km, 30km, 46 km, and a double vertical kilometer. Actually, make that six races, because who would ever want to leave out the ridiculously fun-looking 250 meter and 1 km kids races? (If you can’t smile while watching the kids’ events, contact your doctor about Prozac, stat.) The 30 km course is fast and largely non-technical. If you love that effortless sensation of flying down smooth, friendly single track, well, welcome to Nirvana. Even the 2,000 meters of uphill feels tolerable, with lots of switchbacks, and no shortage of soil. The course is broken up with great diversions: a rocky descent for a kilometer or so, glacial till alongside the upper reaches of Zermattt’s valley, and a nearly 5 km uphill push to Schwarzsee at 2,583 meters. Oh, and there’s no forgetting the Furi bridge. (Walking only, for that section, by the way. Otherwise, you’d need some serious anti-vertigo meds.) From there, though, it’s almost entirely bump-free autopilot down to Zermatt. Prepare to fly, occasionally taking evasive maneuvers around the less-attentive hikers en route. Matterhorn Ultraks’ inclusion in the international Skyrunning Federation series brings an added level of competition and seriousness to the event. Many top runners raced this year’s event, including 2013 Skyrunning Series Champion Stevie Kremer, Sweden’s Emilie Forsberg, America’s Kasie Enman, and men’s runners Zaïd Ait Malek of Morocco, Spain’s Aritz Egea, Switzerland’s Gion Bundi, and US runner Ryan Bak. Matterhorn Ultraks, by the way, isn’t yet such a large event that it’s lost its low-key vibe. In this year’s race, Kilian Jornet jumped into the course to run with Emilie Forsberg for a while. Later in the day, I crossed paths with Emilie, walking towards the Zermatt train station. I was going to congratulate her on another great race…. But somehow, her privacy seemed more important. Not every race allows her to wander down the main town road, taking in the sights. Ultraks, see you in 2015. For whatever it’s worth, you’ve made my every-year-body-allowing trail racing list. 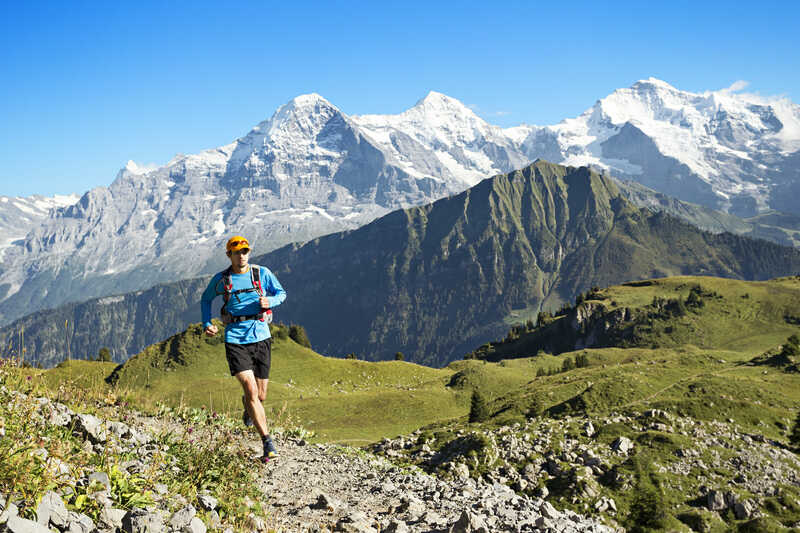 A final shameless commerce alert: For those of you interested in taking part in Matterhorn Ultraks in 2015, Run the Alps will be offering a week of trail running, plus the race, as part of a Run the Alps trip. Drop us a note for details.